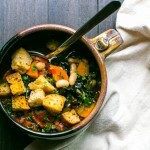 Ribollita with Warm Croutons, also known as Italian Soup, is a quick and easy, white bean and kale soup packed with nourishing and comforting ingredients. Vegan. Hey y’all! Hows your week going? I’m still trying to get my head into the January game. My body is home, but my head is still in Hawaii. I was telling y’all last week about some of our adventures in Kauai, but didn’t quite get to the food scene or why I was locked in the men’s bathroom for over an hour. After all, there’s so much to tell! The food scene on Kauai is vibrant with roadside fruit stands, a fabulous food truck assortment, farm-to-table restaurants and plenty of juice and smoothie bars to choose from. We ate in quite a bit though, making easy brekkies, dinners, and hearty salads and sandwiches on the days when ocean gazing and beach lounging was the priority. It seems like most of the farm stands are located on the East and North sides of the Island. They sell papayas, coconut, pineapple, all kinds of citrus, mango and the most amazing avocado, all on the honor system, so they’re open 24/7, just in case you need a pineapple at 2 am. We wore out the blender making smoothies and pina coladas every day. Guacamole was on the regular, more than I’ve ever had in a 10-day period. I attempted to bring some avocados home with me, but was stopped at the USDA inspection station. They were confiscated along with two limes. I wanted to throw a fit like a two-year-old. I resisted. For veggie tacos (and for Rob, fish), our pick is Tacos Al Pastor in Kappa. It’s a food truck that’s assembled with several others on the main drag. Service was excellent, the food was fresh and seasoned perfectly. The veggies still had a crunch to them, with variety, not boring at all, packed in warmed corn tortillas topped with avocado and a spicy, fresh cilantro sauce that was slathered over the top. Next to the taco truck was an organic shave ice truck where they make their syrups from scratch! I was most impressed and ordered watermelon. An antidote to the blazing 75F temperature. One early morning, we stopped at a little juice/breakfast bar that whipped up some fabulous breakfast burritos, fresh-pressed juice and smoothies. There seemed to be a fresh juice bar in every town! A relief for someone who uses a Vitamix each and every day. I honestly contemplated taking it with us, but ooooh that bag fee! One worry when traveling for me is not being able to find local and organic produce because I cook, pack out lunches, and whip up breakkies even when on vacation. I’m kinda picky when it comes to food. Rob and I find it saves quite a bit of money, so the extra we may spend on a rental through AirBnB or VRBO is balanced with the food cost savings. It’s a win-win! Papayas is a foodie delight co-op tucked away in a shopping area in the heart of Kapaa. It was a regular pit-stop for local produce, more fruit, bulk items and anything else we needed. It was well-stocked, and, surprisingly, the prices are in line with our co-op at home. I planned meals carefully so that I wouldn’t over-buy. After all, having a 50-pound limit on luggage is something I don’t want to exceed.. and some things cannot be brought home (re: avocados and lime). One evening we were at a farm-to-table Taquera. Rob left for the men’s room. When he returned, I took his key for this community restroom, a separate building from the restaurant. It was the men’s key, but I didn’t care. I was too impatient to wait for the women’s room. The maitai was kickin in. I opened the door and threw the deadbolt. When I went to leave, the deadbolt didn’t function. As much as I turned the knob, nothing happened. It was like a bad dream! Luckily, the bathroom was clean and there was a small open window with a good breeze at the top of the back wall. As I contemplated my situation, I decided that things could be worse. So I waited, patiently for about five minutes before I started kicking the door. First, not so hard, then harder, you know, to make some noise. After about five more minutes of this I started getting mad… where the hell is Rob, I thought. Then, I started kicking the door and shouting (so embarrassing), can somebody help me…. I’m locked in the men’s bathroom. Finally one of the waitresses came out and then I heard Rob’s voice. What a relief! About an hour later, with a chiseled out deadbolt and kicked-in door. I was rescued. When Rob was in there prior to my being locked in, he hadn’t thrown the deadbolt. He asked why I did. Good grief. Oh there’s so much more…. but we’ve gotta talk about this quick and easy over-the-top Italian soup! I’ve shaken up the classic Ribollita with this recipe, leaving out the meat and most of the bread, and cooking this fast. But it doesn’t lack for flavor. I’ve been making this for years and find it to be my go-to on nights I want something hearty, comforting, quick and easy. For rewarming the croutons, preheat the oven to 350F. Add oil to a large sauce pot or Dutch oven. Heat until shimmering. Turn heat to medium, then add onion and garlic. Saute' until onions are transparent, about five minutes. Add the carrots and celery, stirring occasionally for five minutes. Add the broth, and beans and heat to a simmer then cook for an additional five minutes. Add the tomatoes and juice, kale, basil, 2 Tbs of parsley, pepper and salt. 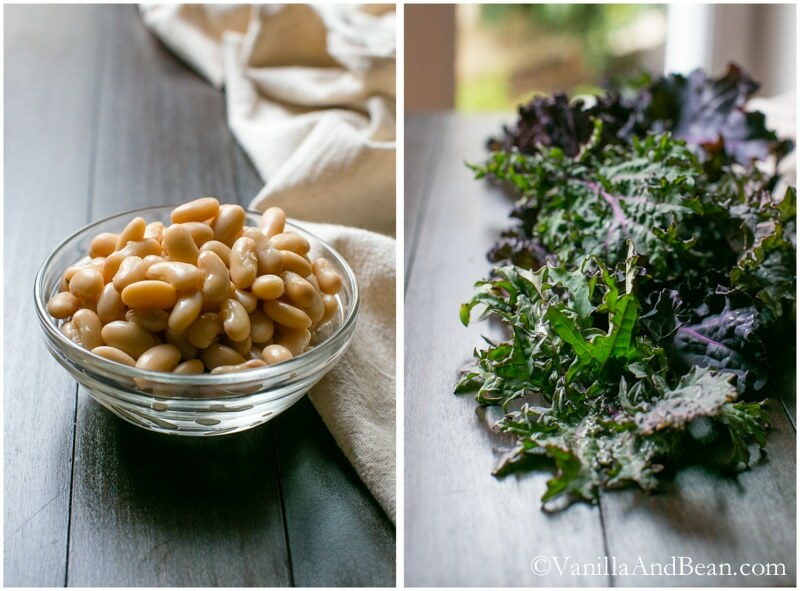 Cook for an additional 7-10 minutes or until the soup is heated through and the kale is tender. Just before the soup is done, warm the croutons in a 350F (280C) preheated oven for five minutes. Serve with croutons on top, and more for sharing. Garnish with parsley. For leftovers, freeze in a lidded container (I use Ball jars) for up to two months or in the refrigerator for up to three days. Oh my gosh, Traci! What an unfortunate place to get stuck for an hour! At least you have a hilarious story to tell people now :) I was already excited about Kauai from your last post, and now I am itching even more to get there! The food scene sounds so amazing. I remember shave ice from my first trip there – I always got the rainbow option – and I can’t wait to try it again. And those tacos? I have already bookmarked that restaurant! This soup looks so comforting yet healthy. It’s got such a great combination of textures and flavors, and I love how it is so easy to throw together. I’m especially eyeing those beautiful croutons! Once you make your own croutons, you can’t go back! Thanks for the lovely inspiration, my friend! Thank you Julia! No doubt, funny and really, it was fine. After all, I was on vacation in such an amazing place! Who could get mad about that!! It’s not like I was going to be late for work… Instead, I was late for my maiti! ;) No doubt homemade croutons make this soup! Traci, I just have so much fun reading about your Kauai adventures and your bathroom story made me laugh out loud! Thanks so much for bringing a smile to my face. :) I need to find more farm stands to visit next time we are out there! Soups like these always make me feel so good and croutons on top gives it that perfect crunchy finishing touch. Beautiful. OMG, getting locked in the bathroom, sounds like a nightmare :) Sounds like you had a great trip! I need some of these food trucks around me! The soup looks perfect Traci! Loaded with awesome ingredients! Ha ha, oh my gosh that sounds like something that would happen to me…(getting locked in the bathroom). And now I really REALLY need a holiday, Hawaii sounds divine! This soup looks just perfect for the cold weather we’ve been having! And those croutons look to die for! Your trip sounds AMAZING except for the getting locked in the bathroom part. I would’ve been totally freaking out but it makes a good story, right? 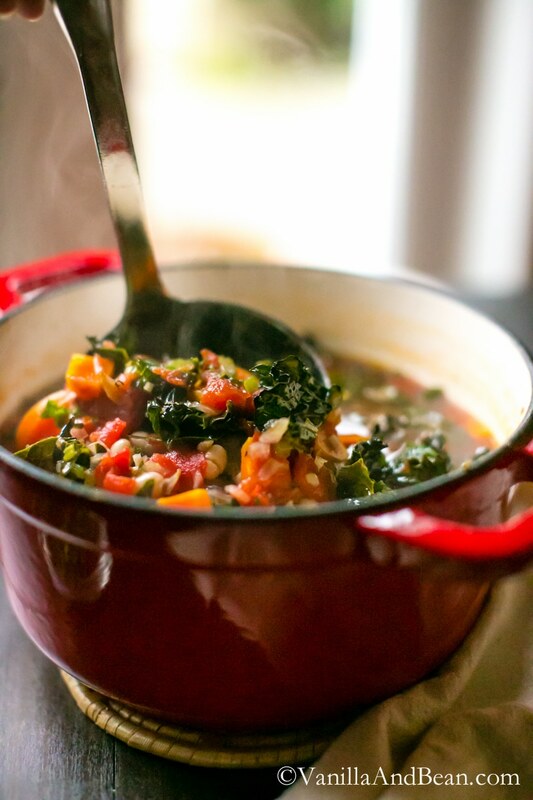 :) I’m loving the sound of this soup – it’s so warming and hearty. Perfect for these chilly Washington days. Definitely going to try this one out! 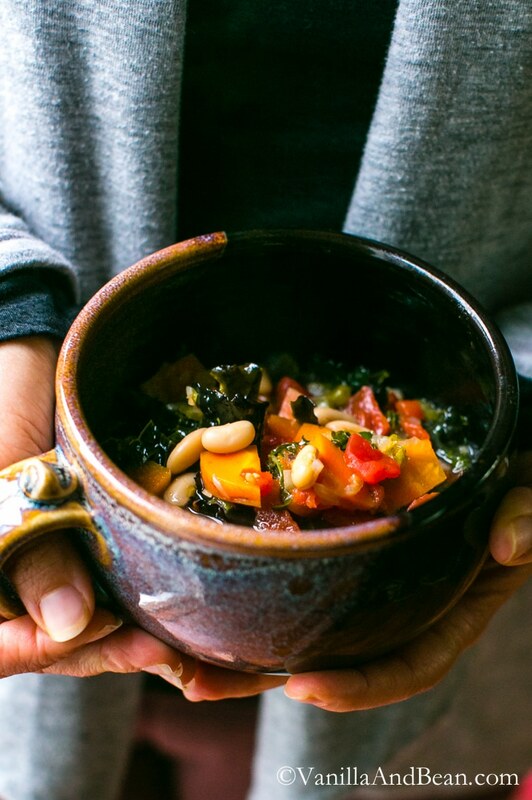 This is a gorgeous bowl of ribollita – I’ve never had that either, but love all the veggies in it! You’ll do it Shashi!! It is amazing! Yeah, just stay away from the deadbolt and have someone stand by the door instead! haha! Oh yes, Ribollita is packed with veggies. So hearty and such a good soup too when feeling under the weather! Thank you Shashi! 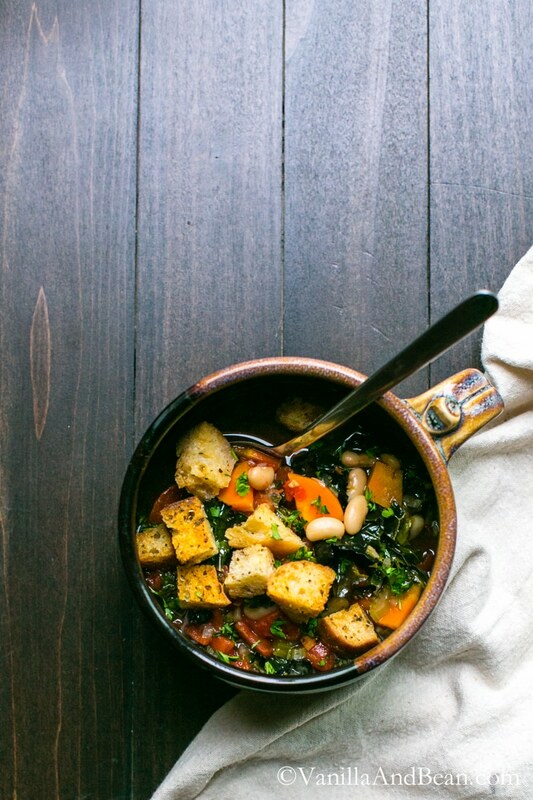 I love ribollita — it’s just the ultimate easy, comforting winter food. 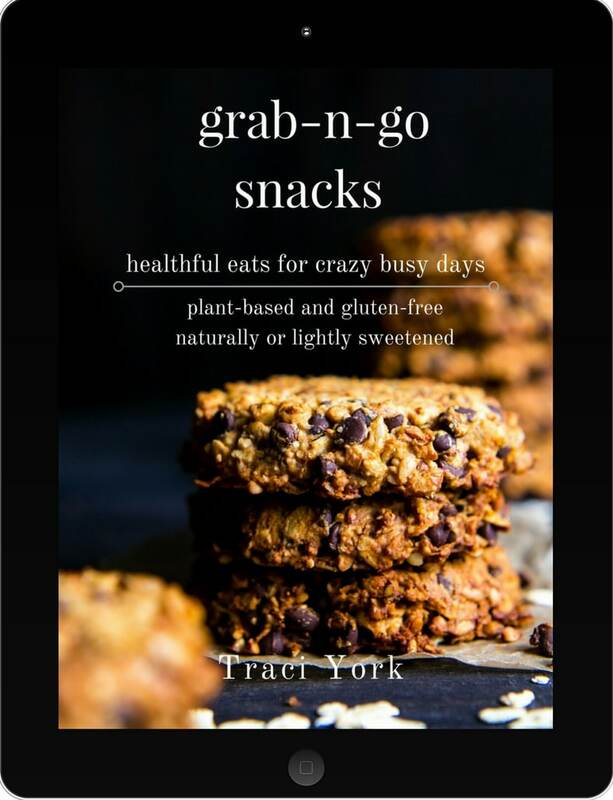 This is beautifully presented and so rustic — can’t wait to try, Traci! Ha! Traci, you had me rolling with your bathroom story – I can just picture you kicking the door and yelling for someone to help you! Otherwise, your trip sounds amazing and so is this dish! 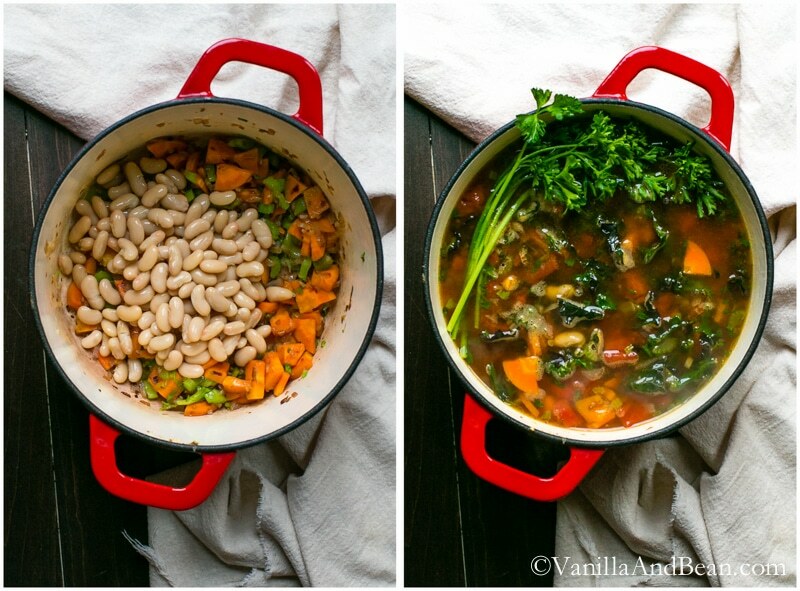 I love ribollita and your photos are so gorgeous I want the whole pot! I saw this over on Fridgg. It looked so beautiful I had to check it out. Looks super hearty. Welcome back to January! Oh my gosh!! You poor thing! I can’t believe you got locked in the mens room! Also, I’m sorry it took so long for them to get you out! …but on a much brighter note, this recipe looks amazing! So perfect for a chilly evening! Truly healthy, warming, lovely comfort food! Thanks for the recipe! Hehe!! I know?! Right? No worries. It was really quite funny! A chilly evening and this soup is made for each other! I hope you enjoy it my dear! “Why did you throw the deadbolt?” – is a question my husband would ask too. Seriously, how in the world ?!! Ahhh… The difference between men and women, I guess..
Oh my Gawd, that men’s bathroom sitch sounds like my worst nightmare! I’m glad it was clean!!! At least you have a funny story now! And I LOOOOVED the produce in Hawaii, it is so freaking good. I ate papaya everyday, and the avocados – I don’t blame you for wanting to throw a tantrum when they took them away. But the produce in these photos is just gorgeous as well! Is that a giant carrot? My baby girl has a phobia of being stuck in bathrooms! One hour is a looong time to be stuck! Oh my I would’ve had a major panic attack. :) I would’ve dunked my head in a bucket of cocktail after. haha But whats a vacation without a story, right?! Oh no! Getting stuck in a bathroom would be one of my worst nightmares! Hopefully this wonderful soup makes up for it! I stumbled across your blog on Instagram earlier today and am now following you on everything! I’m obsessed! Your food looks incredible, as well as your photography. 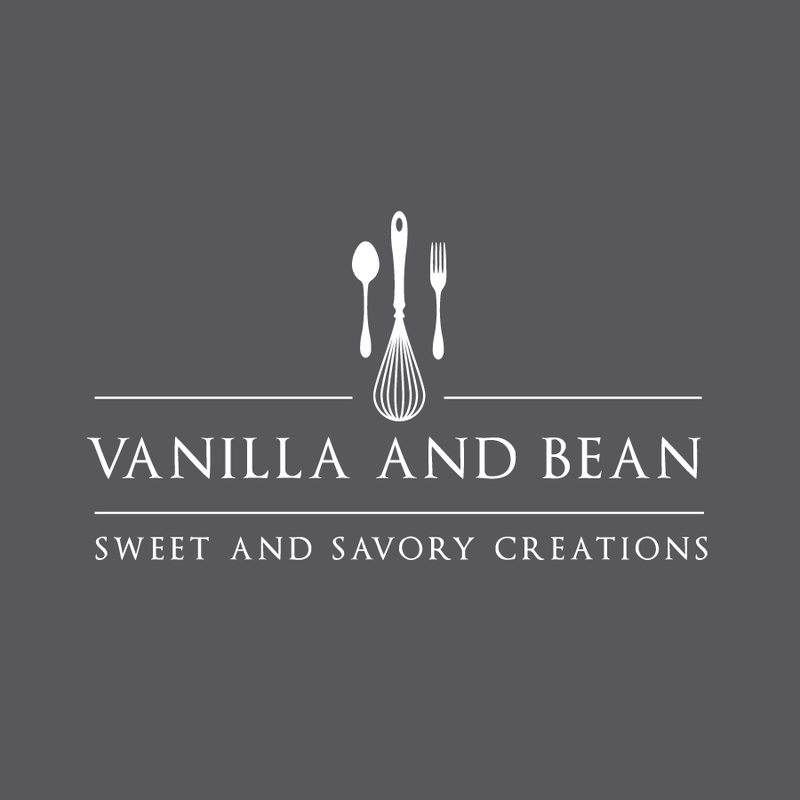 Can’t wait to keep following you and seeing what new recipes you share! I know, right? Just being in HI made up for it. No bad days! Thank you for following my dear and your kind comments! :D Welcome! I can’t believe you got locked in the bathroom – and the boys bathroom at that! OMG – I love how you wait patiently and then gradually start kicking the door harder and harder! Thank goodness they got you out – I can’t believe it took an hour to chisel open the door. That is definitely a night to remember. 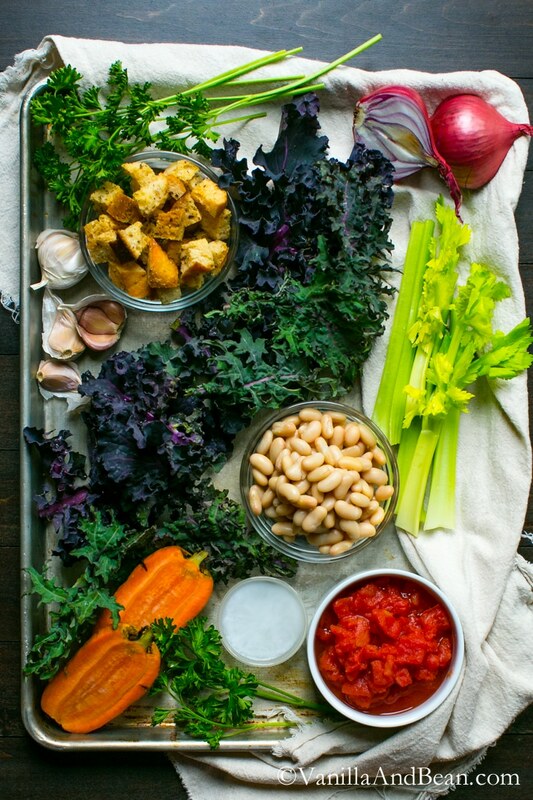 PS: love this soup – and I like that you’ve made it a healthier version – perfect for the new year! PPS: I haven’t been getting your site feed lately either – I use LEAF as my RSS feed. Leaf is an rss feed/news reader (kind of like feedly) – it’s an app from iTunes. But as I type this your post just popped up in my RSS feed reader – so it’s just delayed somehow. It’s been coming in spotty over the last month or so – sometimes I get your post and sometimes I don’t and sometimes it comes late (like today). After falling in love with apple bananas, I tried to smuggle some on the plane, only to have them confiscated. I seem to recall throwing a very toddlerish tantrum! The recipe looks amazing, and I love the stories! LOL!! You’re crackin me up Emilie!! :D As my Mam-maw would say… I knew where I was all along! I had a big tall mai tai afterwards.. it was all worth it! hehe! Oh this soup looks fabulous Traci! The colors are gorgeous. It sounds comforting and hearty enough for a nice winter dinner! So sorry about the bathroom mishap in Hawaii! Yikes! Enjoy your weekend! Oh my goodness your story!!! I was laughing out loud :) We’ve totally all been there before. At least it was in Hawaii, that’s probably the easiest place in the world to forget about it! The soup—- oh it looks so perfect for this time of year. I’m having trouble adjusting to the frigid temperature now too, so I’m sure this will make things a LITTLE easier. Oh my, Traci, this looks amazing!! I don’t know why I wasn’t getting your updates, but Feedly wasn’t showing me any of your new posts! I thought something seemed suspicious with no new posts from you for that long, so I went ahead and came over here…glad I did because woah, clearly I’ve been missing out!!! So sorry about the bathroom incident…that is scary! Something similar happened to me when I was in the fridge at the commercial kitchen I sometimes teach at. Apparently I wasn’t pushing the door hard enough, but I had a couple minutes there were I started panicking and started knocking hard on the door till one of the chefs in the kitchen opened it for me. Whew! No doubt, right? So funny in hindsight too! I was calm and collected after ‘they’ showed up, and knew it was going to be okay. Awhhh life.. sometimes it’s just embarrassing! :D Rob and the maintenance guy said they’d never heard or seen a stuck deadbolt before. Go figure!